Acne scars can be a issue for many and finding a honest acne scarring treatment is hard. Scars are a result of skin surface damage. Some individuals suffer this after a natural immune system response to inflammation. Sometimes, acne scars are a result of squeezing spots or by excessive rubbing and touching of the skin. In some cases, scarring can occur due to genetic susceptibilities. Acne scars may also leave red or brown marks at the site of infection after healing. 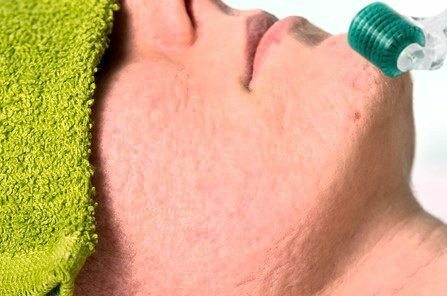 At Clear Medical, we use Microneedling as an acne scarring treatment. The microneedling treatment induces a reaction to the cell damage caused by punctures from the roller. This triggers the release of growth factors; a result of the natural immune system response. Moreover, mechanisms such as, release of proteins (cytokines), clotting factors etc. are also triggered. This ensures optimum skin healing and cell production is stimulated. Simply, the treatment manipulates the natural mechanisms of skin cell production and accelerates healing. Many clients at Clear Medical have seen their scars reduce in size after their first treatment! The acne scarring treatment usually lasts between 20-40 minutes, however this depends on the client and the treatment area. Initially, skin is prepared for treatment and it is thoroughly cleansed. The skin is then anesthetized (10-15 minutes) and then the procedure is carried out. Post treatment, another 10-15 minutes are required to nourish and prepare the skin for the environment. Pores close approximately 1 hour after the procedure and the absorption of nutrients into the deeper dermis is up to 30 times more efficient before that. The total time required for the treatment is around 90-120 minutes for most individuals having facial treatments. The recommended number of treatments is 1-6 depending on the client’s individual requirements. Individuals can, nonetheless, have as many or as little as required. By persistently triggering the healing process, the body continues to promote cell growth over the skin surface. We do not carry out treatments within 12 week intervals. Skin needs time to heal between one treatment to the next. Clients that follow treatment guidelines achieve the best aesthetic outcomes. Microneedling is one of the safest skin treatments available. It is safe for all skin types and ethnicities because this treatment does not stimulate or repress brown protein production. There is no risk of either hypo or hyper pigmentation. This is because the melanocytes (cells producing melanin) that reside in the basal layer of the epidermis remain intact during the procedure. The treatment is uncomfortable but this can vary on the individual’s pain tolerance. Redness, swelling, soreness, and a burning sensation are the common side effects which may last up to 48 hours afterwards. The skin may also become dry and flaky for up to two weeks after the procedure. When washing the skin, take care and treat it as gently as possible. Cleanse only with water for up to 36 hours post procedure, to ensure ideal skin health. Makeup or chemical, cannot come into contact with the skin within this time also. We recommend the use of our Tone & Defence Skin Oil (a complementary 30ml size is provided with each treatment). The price of the Microneedling treatment varies according to the area or size of the scar. We are proud to uniquely provide skin treatment pricing per cm². This ensures that at Clear Medical the pricing is concise, consistent and fair. The acne scarring treatment does not require any prior tests to assess your suitability. However, we do advise that you contact us before the treatment. This is so that we can best prepare you for your micro-needling session and give aftercare advice.